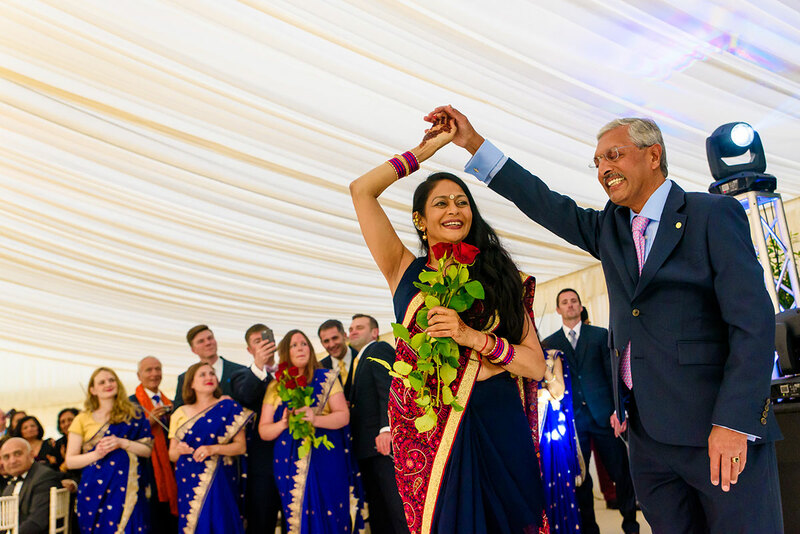 Chakshu and Adam’s Indian wedding at the beautiful Seckford Hall was nothing less than pure fun and joy to capture. Their celebrations took place over two days and was full of smiles and emotion. Adam’s parents, as well as the majority of his friends and family flew in from the US for the events. Many of them hadn’t previously witnessed such colourful and traditional Indian wedding celebrations. It was so nice to see them all take an active part in it all. It was evident that they all enjoyed the cultural experience. And boy, do they know how to party! The pre-wedding ceremonies took place first. Both Chakshu and Adam received some nice helpings of turmeric paste for their troubles. It was evident that those applying the yellow paste were clearly having too much fun! If the truth be known, so was I and it was a pleasure to be their Seckford Hall wedding photographer capturing some highly-charged fleeting moments. Adam really did play the part and get involved. From riding in on a white horse, to fending off the bride's side when his shoes were stolen, the day was full of fun and laughter. Both families had a great time as was evident in the photos. Immediately after the beautiful Indian ceremony had finished, we proceeded to complete our couple photos. The chemistry between these two really helped elevate the photo session and we were able to take some fun images. As evening approached, it was great to see both sides of parents make a lively entrance into the reception room. The welcome that all the guests gave was wonderful. Both Chakshu and Adam made their way in underneath a sparkler tunnel before dancing their way to the head table. After some quite comical and emotional speeches from both sides, it was that time...time to party! As a Seckford Hall wedding photographer, I get the opportunity to meet new people all the time. With these two, it was quite clear to see that they are perfect for each other. I sincerely wish them both every success for their married life together. Thank you to both for choosing me to be your Seckford Hall wedding photographer. It was fantastic to be part of your celebrations. Below are some highlights for you to enjoy. If you share the same high regard for timeless moments being captured in the most creative of ways then I would love to hear from you. Do feel free to contact me on info@jermainechandra.com or call on +44 (0) 7835 58 22 58 if you are looking for a Seckford Hall wedding photographer. I look forward to hearing more about your Asian wedding photography requirements. These are absolutely stunning! Looks like such a fun wedding you two! Love to you both! To see these beautiful pictures is to share in your joy. Congratulations! You have truly captured the love and joy of Adam and Chakshu’s wedding! Can’t wait to see more pictures! It was all so magical!!!! Can’t believe its over.Love you both!!! Jermaine, these photos are lovely, thank you! We’re just back from the Maldives and finally getting a chance to look at them properly, it really has been a whirlwind 2 weeks! Thank you for the preview and thank you for being so great over the wedding weekend – I loved having you there!